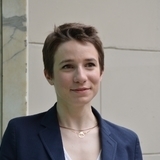 Federica Buzzi is an independent curator and writer, her current research integrates architecture with contemporary art to interrupt mono-disciplinary discourse and advance the understanding of these fields towards their relationship with general culture. She experiments with a range of formats including exhibitions, publications, writing, commissions, and events. Trained in architecture at the Politecnico di Milano, she continued her studies with the Curating Contemporary Art MA at the Royal College of Art in London where she graduated in 2016. In 2018 she took part in the 8th Gwangju Biennale International Curator Course. She runs the Brussels-based initiative DEMIMMONDE, a platform exploring eroticism and space.